Sean May is Certifified by the Law Society of Upper Canada as a Specialist in Criminal Law. This specialist designation is awarded by the Law Society to criminal counsel who have distinguished themselves in practice based upon experience, reputation in the Court system, and dedication to the practice of Criminal Law. Sean May has practiced Criminal Law exclusively since 1989. In over 27 years as a lawyer he has successfully represented his clients by diligence, determined hard work, meticulous preparation and attention to detail. He has represented clients in every level of Court, conducted many Jury trials and often represented people in extremely serious cases. Sean May was part of the legal team for Military Member, Kyle Brown, who was charged with murder in Somalia – a case which led to the Somalia Inquiry. Most recently he successfully worked to achieve the withdrawal of all criminal charges against former Canadian Senator, Mac Harb. On March 30, 1989, the day after being called to the bar, Sean May opened his law practice working exclusively in the area of criminal law. Starting with just a few clients, he quickly earned a reputation for hard work, attention to detail, and devotion to providing his clients with a first rate defence. As his practice grew he soon became one of the busiest criminal lawyers in the Province, defending people charged in every kind of case and achieving great success for his clients. Sean May graduated from the University of Ottawa law school in 1989. He is from Ottawa and growing up in the city gives him knowledge and experience he is able to use in his trial work. Sean May is highly driven to get justice for each and every one of his clients. Sean May – Certified Specialist in Criminal. This recognition, accorded by the Law Society, reflects his substantial experience, extensive work in the Court system and his excellent reputation as an advocate. Now in his twenty-eighth year as a lawyer, Sean May is proud to have been joined in practice by his partners Kate Irwin, Sam Adam, and his associate, Jasna Drnda – all exceptional lawyers in their own right. Over his time in practice, Sean May has defended his clients in every kind of case; in matters ranging from Impaired Driving, assault, fraud and theft, to robbery and homicide. He has appeared as counsel in many extremely serious and notable cases which have been in the public eye. These have included being part of the defence team for Private Kyle Brown, the Canadian soldier charged with murder in Somalia. This important case led to the Government of Canada’s Somalia Inquiry. 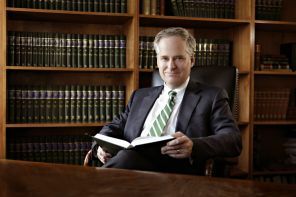 Sean May’s practice has also led him to act in political cases including most recently in the successful defence of former Canadian Senator, Mac Harb. Sean May has represented clients at all levels of court from the Ontario Court of Justice, to the Superior Court of Justice to the Ontario Court of Appeal. He practices primarily in Ontario, but has also appeared in many cases in the province of Quebec and in Nunavut. In addition to criminal matters, Mr. May often works as counsel in regulatory cases, including Environmental and Occupational Health and Safety law. As a measure to the extent of his practice, Mr. May has also worked to represent police officers including SIU (Special Investigations Unit) cases. The criminal defence law firm of May Irwin Adam is one of the top firms in the City of Ottawa. In giving our clients the very best defence we bring the full range of resources.